Description: NO NYC; Permit or FFL required for CT buyers. This listing is for ONE Magazine. Here are new and unfired compliant Glock factory magazines to fit the model 20 pistol chambered in 10mm caliber. They will also fit the Glock 29, but will protrude from the smaller gun’s shorter grip frame. These magazines will NOT work in any other pistol besides a Glock 20 or Glock 29. Manufacturer is Glock gmbh of Deutsche-Wagram, Austria. Importer and warrantor is Glock, Inc., of Smyrna, GA. Construction is High Impact Polymer with metal interior lining. Each magazine holds 10 rounds of 10mm caliber ammunition. That is five fewer rounds than the standard Glock 20015 magazine. Please specify if you have a 4th Generation Glock and plan to set it up for left hand shooter, so that we can pull you 4th gen mags with their dual magazine release cuts. 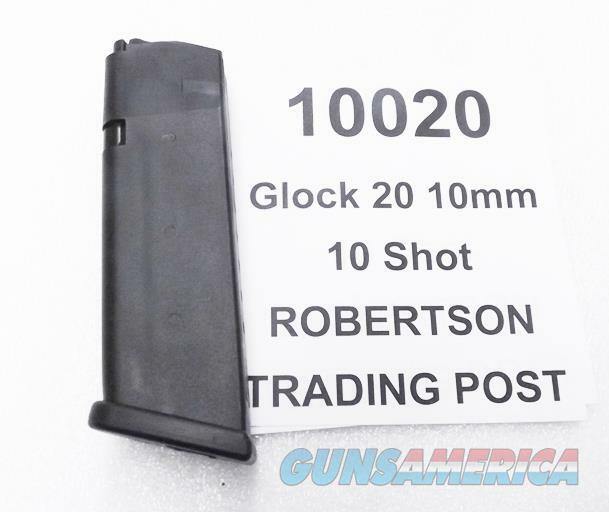 All our Glock 10mm magazines are brand new and unfired, sometimes they are not packaged because we pulled them from brand new pistols that we subbed number 20015 magazines for and shipped to states where those are permissible for civilian ownership. Recent replacement pricing on these in our area has been as high as $40 apiece. We’re offering the Glock 10mm Mags in the photos, however, or their identical mates, each	for only $ 21.00. Not for sale to residents of New York City. FFL or State Permit copy required for buyers in Connecticut. $3 Lower 48 First Class Mail; $10 Priority to AK HI PR. Buy 3 Ships Free: Combine any 3 of our items, and get free shipping. Lower 48 only, excludes long gun barrels and gun cases. $3 lower 48 on 1 or 2 items. $10 combined shipping to Ak, HI and PR no matter how much you buy, excludes long gun barrels, swords and gun cases.